L.A. Noire by Rockstar games has a great story, it's strong and holds it's own against television shows, films, and novels. You're a former war hero turned beat cop, after you complete every chapter in the game you begin to rise in ranks, you move from the beat to traffic to homicide, you follow this character's career all the way. What stands out for L.A. Noire isn't the gameplay, the realistic traffic, or the genuine Los Angeles setting, but the writing and acting. The performances in L.A. Noire are believable and ofter riveting, and the gameplay is wrapped up in that acting. When you question a suspect you need to call whether they are lying, holding back or telling the truth. And this is based on the actor's actual performances and those performances have been captured with great detailed down to the slightest blink which we have not seen till now in a game. That degree of accuracy to follow facial expressions to solve a game. The cast is full of actors from movies and television shows you may now such as Madmen and Fringe. I found myself forgetting that this is a game, it fells more like a full season of a cop TV show, but you get to play it all out yourself. 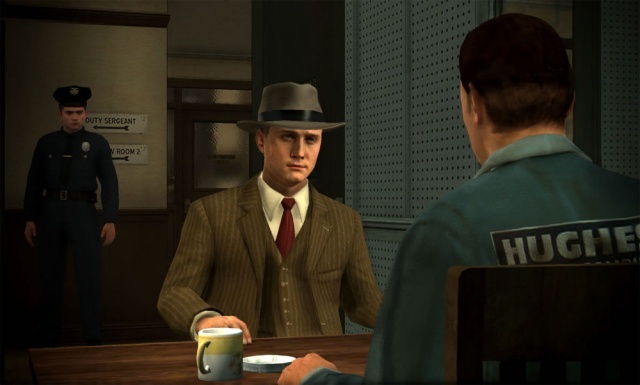 There are a few issues with the game, looking around for clues in L.A. Noire can feel a bit clunky and hit or miss. You get a vibration when walk by a clue but leads to a lot of dancing around the evidence. If you liked Heavy Rain you're going to feel right at home with this game, it's not as emotionally impactful as Heavy Rain but this is an experience very people should miss. This is a step forward for a video games both technically and from a performance stand point. L.A. Noire is pushing the medium of games forward and for that we give it 9 out of 10 stars.